Added more issues of the mushroom newsletter, Omphalina, to the Mushroom Miscellanea page. Added more Persoonia PDFs to the Mycological Journals page. Added "A Taxonomic Investigation of Mycena in California" to the Mycological Literature page. Added "The North American Pyrenomycetes" to the Mycological Literature page. Additions to the Mycological Literature page. Added "The Corticiaceae of North Europe" to the Mycological Literature page. Added a more journal PDFs to the Mycological Journals page. Added a Mycological Journals section to the Systematics pages. Added Overholts' "Polyporaceace of the United States" to the Mycological Literature page. Additions to the Mycological Literature and Fungal Descriptions and Keys On-Line pages. Added 47 issues of the excellent mushroom newsletter, Omphalina, to the Mushroom Miscellanea page. You probably have noticed that there have been no new updates in many months. I am spending all my time working on the forthcoming book California Mushrooms. Updates will resume after the manuscript and photographs are done and are sent to the publisher sometimes this summer! Many new C. H. Peck papers at the Systematics pages. Alphabetical index to over 700 large (mostly 1280 x 960) photographs by Michael Wood. MykoCD by Michael Wood et al. Numerous additions to the Systematics page, mostly links to more keys to the fungi. 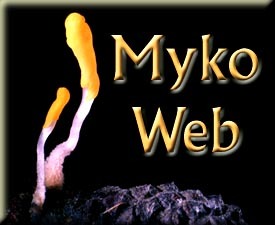 MykoWeb has a new look for the Summer of 2006! Mycorrhizas (1) -- The Source of All That Is Good? Mycorrhizas (3) -- Why Are They so Successful? Previews of the wonderful watercolors by Beverly Hackett can be accessed from the Miscellanea page. New photos on the Miscellaneous Fungi page. A new MykoCD is now available! Added over 20 species to the Forthcoming list at California Fungi. You can except to see full descriptions with photographs of most of these within the next month. New page of Systematic Resources for the higher fungi. The "Fungi of the San Francisco Bay Area" is now "The Fungi of California"!!! New images on the Treasures page. "Spring Fungi of the Sierra Nevada Mountains" changed to "Fungi of the Sierra Nevada Mountains." Bay Area Fungi is now a BioMed Link three star "indespensible" site. Additions to the Links page. Many (almost 40) additions to the Links page. New links on the Wild Mushroom Recipes page. Changes to North American Mycological Societies. Changes and additions to the Links page. MykoWeb has a redesigned look! The "Common Fungi of the Bay Area" has been renamed the "Fungi of the San Francisco Bay Area"